The She-Shepherd and I have a female friend. We work together, and we both do a job that requires a lot diplomacy and negotiation. Her typical communication style is conciliatory. While this can help her to get different parties to agree on something, it also has a profound effect on how she presents herself to the outside world. She often walks with her arms folded and head down. She avoids eye contact unless in a direct conversation. Her gait is short and shuffling. For this article, we’re going to call her Rose. What’s interesting about Rose is that while her posture and physical mannerisms typically indicate a “prey animal,” she’s quite capable both professionally and recreationally. She does a TON of handiwork around her house, including running a lot of power tools, building things, etc. She organized and participated in raising her house off its foundation so she could increase the height of her basement. Rose assists many of our co-workers with renovation projects like refinishing their cabinets or building furniture. We knew that she had a desire to be self-reliant, learn new things, and follow procedures. These are all good attributes to have as a student of fight-focused training. She also needed a boost in the confidence department, and that’s something we’ve seen with many students of fight-focused training, male and female alike. Rose had no prior personal experience with firearms. Her immediate family leaned anti-gun, mostly because they didn’t have any personal experience with firearms. They believed whatever the Democratic party said about guns. Her extended family fit the typical “Fudd” stereotype. According to our friend, her extended family would get drunk and then go shoot their guns in the woods. Not really the paragon of responsibility or gun safety. With fall bearing down on us, we asked Rose to go to one of QSI Training‘s last classes of the year. Here’s how we introduced Rose to firearms, and how she did in her first and only firearms class. Before class, we invited Rose over to our house to explain some basic things we wanted her to know. Just like doing construction work, we wanted to put safety first. 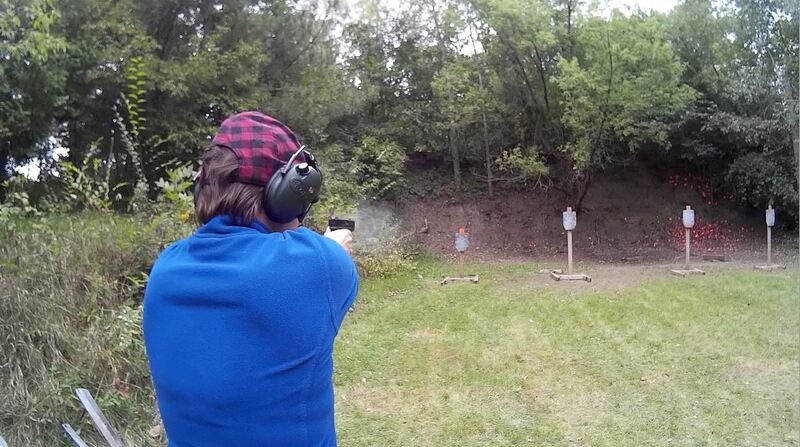 We talked about the four rules of gun safety, as well as additional rules about range safety. This was good for Rose because she already heard – and gave – safety briefings before. Rose easily took to the idea of not pointing a gun’s muzzle at herself or anyone else because she already had experience running tools with similar safety concerns. Watch your hand with the table saw. Don’t rest your finger on the trigger of the circular saw. Don’t point the nail gun, or a real gun, at anything you don’t want to hit. We knew that she was curious about how power tools worked, and we decided to talk about guns and ammunition just like other dangerous tools. These are the components of ammunition. This is how ammo works. These are the parts of a handgun. We covered grip, sight picture, and how to press the trigger properly. We covered loading and unloading and how to draw from a holster. I demonstrated the technique two or three times, and then she did the technique two or three times. We didn’t expect her to remember everything, but we wanted to give her a preview of what would be at class that weekend. In short, Rose did great. She admitted to being a little nervous at the start of class, but Erik, Gabe, and Sam from QSI were their usual top-notch selves. Part of the basic class is about how to avoid trouble, de-escalate a situation, and then optionally issue a challenge. At first Rose was polite and demur as usual. The She-Shepherd offered some advice and encouragement, and Rose’s voice became more assertive. “Defensive hands, not submissive hands!” She-Shepherd called out, and Rose went from holding her hands up in the air like a prisoner to protecting her face like a fighter. These little adjustments made a big impact, and by the end of the day Rose was more assertive and confident in class. I wish the Advantage Arms kit was more reliable. After watching her shoot compared to the other students I think everyone should start out with light- or no-recoil pistols. Rose was able to concentrate on the fundamentals instead of anticipating and fighting recoil — something almost all of the other students struggled with throughout the day, including multi-course alum. One thing Rose struggled with was manipulating the magazine release on the Glock 19 frame. It was hard for her to reach the release with her right hand, and she often had to depress the release with her left hand. This is not the ideal technique for several reasons. I wonder if she would get better at this over time; perhaps it’s hand strength, or worrying about dropping the gun, or just familiarity with where the controls are. It was a good reminder that people — especially new shooters / first time firearms owners — should test fire handguns before buying them. One size does not fit all. Rose commented that the students and instructors changed her opinion about people who carried guns. She had met some of our classmates as friends of ours first, but this was her first time seeing any of us put on war faces and shoot. “No one is like what I expected. They were all really friendly!” Rose did recall an anti-Obama statement made during class, and while that was surprising to her it gave us an opportunity to discuss the political motivations behind gun control. For any of us attempting to broaden the number and types of people shooting guns, it was a good example of keeping politics in the class at a minimum. It’s too soon to tell if Rose’s experience at class is going to rub off on her day-to-day life. It probably isn’t reasonable to expect one class to turn someone’s life around. However, when The She-Shepherd asked Rose if she’d like to take another class Rose replied, “maybe, and if I did it would be that ‘force on force’ thing Erik was talking about.” Talk about jumping into the deep end of the pool. However, Rose is a practical person, and I think the practical experience gained in an FoF class is right up her alley. We’ll see if she returns later this season or next year for more training. Regardless, Rose took the opportunity to learn more about firearms and possibly change her mind about them — and maybe even change her life. It’s not up to us to change people’s minds, but we should put ourselves in the position to help people learn and decide for themselves. Hopefully Rose won’t be the last new person we bring to class, and I hope you can do what you can to bring other newcomers to fight-focused training. 1 Comment on "Help Flowers Bloom"
Have her try a Glock 19 Gen4 with the magazine release on the right side of the gun. She can use her index finger to release the magazine. I am left handed and have always used this method and never had a problem across many defensive courses, competition and recreational shooting.